Dermatopathology is the pathology of skin. Pathology is a significant part of dermatology and dermatologists spend five years in residency. So, it is a huge area. 7.3.2 Xanthogranuloma in scrotal skin. Shave biopsy = done for what is presumed to be benign disease - classically exophytic lesions, e.g. seborrheic keratosis. Saucerization = scooped shave biopsy. Punch biopsy = cylindrical piece of skin, usu. epidermis and dermis - suspicious lesions/malignant lesions, e.g. basal cell carcinoma. Incisional biopsy = a piece of the lesion for pathologic assessment; lesion not completely removed. Excision = lesion cut-out with intent for complete removal - usual has a generous margin, e.g. malignant melanoma excision. Re-excision = done to get a wider margin or remove part of a lesion that was incompletely removed in a prior excision. Conservative re-excision = cut-out more with a minimal rim of normal tissue. Sentinel lymph node removal = a special type of lymphadenectomy usu. done for staging, esp. malignant melanoma. Epidermis - outer most layer, avascular, separated from dermis by a basement membrane, epithelial tissue. 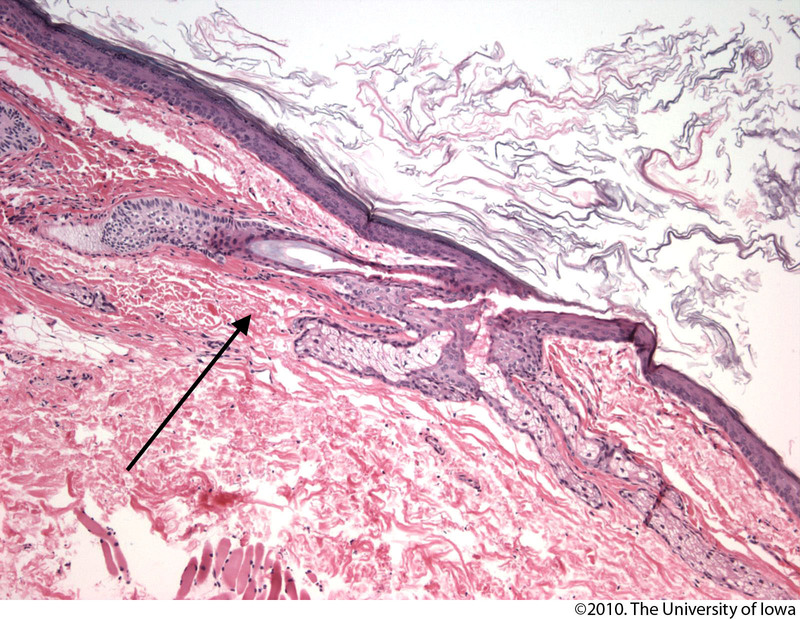 Dermis - below the epidermis, vascular, separated from the epidermis by a basement membrane, connective tissue. The layer below the skin is the subdermis (AKA hypodermis, AKA subcutaneous tissue). It is below the dermis and consists of adipose tissue. Present only in "thick" skin. Stratum spinosum (aka prickle layer). Mnemonic: Corn Lovers Grow Several Bales. Usually eosinophilic cytoplasm - important feature. May have clear perinuclear halo (glycogenated keratinocytes). Intercellular bridges (high power) - key feature. Pericellular clearing - key feature. Trilobated nuclei - 2-3 little dots - key feature. Paget disease: large cells with clear cytoplasm, may cluster, above basal layer. May palisade focally ~ 1:2 = width: height. Melanocytes < 25 melanocytes / 0.5 mm of basal layer. Basket weave stratum corneum (non-acral skin). Location: superficial - opposed to the deep aspect of the epidermis. Appearance: dense, thick collagen bundles. Location: deep - between papillary dermis and subdermis. Layers of the dermis - labelled (biology-online.org). Layers of the skin (melanoma.blogsome.com). Eccrine gland clusters of tubular structures, pale cytoplasm thermoregulation (cooling) - produce sweat CK7+, CEA+, CAM5.2+, EMA+ ? ? Apocrine gland apical snouts, tubular structures ear wax, body odor ? ? ? Sebaceous gland clusters of cells side-by-side, pale fluffy cytoplasm grease hair, sexual lubrication ? assoc. with hair follicle ? Hair follicle linear structure keep individual warm ? assoc. with sebaceous glands ? Eccrine glands - spindle-shaped myoepithelial cells surround luminal cells. Eccrine ducts - cuboidal type subepithelial cells. † Definitions vary -- some authors use a 5 mm cut-off. Dermatopathology doesn't have intuitive terms, e.g. thickening of the stratum spinosum isn't spinosum hyperplasia. The terms have to committed to memory. † These definitions are not universally accepted. Epidermotropism is sometimes used in the context of benign disease. Crust = epithelial elements, blood. Non-malignant skin disease is common. It is the domain of dermatologists. It can be scary for general anatomical pathologists because the differential diagnosis is often broad, and, it's generally not something the general anatomical pathologist sees a lot of. Dermal cysts, e.g. epidermal cyst, pilar cyst. Epidermal necrosis, e.g. erythema multiforme, toxic epidermal necrolysis. Bullous diseases, e.g. pemphigus vulgaris. Granuloma annulare dermal palisading granuloma around necrotic collagen mucin in centre of lesion, (peripheral) lymphocytes, usu. more superficial than necrobiosis lipoidica benign, self-limited none (CD68?) necrobiosis lipoidica, rheumatoid nodule, epithelioid sarcoma Other ? Eccrine poroma abundant basaloid cells with (small) ductal structures incloses islands of sclerotic stroma with edema erythematous lesions Stains/IHC ? DDx ? Other ? Chondroid syringoma (mixed tumour of skin) chondromyxoid stroma, epithelial component epithelial component in nests with eosinophilic cytoplasm, round/ovoid nuclei with nucleoli Clinical ? Stains/IHC ? DDx ? related to pleomorphic adenoma (???) Image ? Angiokeratoma ectatic superficial dermal vessels + overlying hyperkeratosis - may be seen in Fabry disease Stains/IHC ? venous lake Other ? Epidermal cyst cyst lined by squamous epithelium with a granular layer keratinous debris, no skin adnexal structures cyst none pilar cyst, dermoid cyst Other? Pilar cyst (trichilemmal cyst) cyst lined by squamous epithelium without a granular layer keratinous debris cyst none epidermal cyst Other? Steatocystoma cyst lined by squamous epithelium with a corrugated eosinophilic lining epidermis has no granular layer cyst none dermoid cyst, follicular cyst Other? Seborrheic keratosis - typically has more hyperkeratosis, pseudohorn cysts. Dermatitis herpetiformis: gluten enteropathy (celiac disease), thyroid disease, intestinal lymphoma. Pemphigus vulgaris: thymoma, myasthenia gravis, malignancy. A. Inner labial biopsy shows subepithelial hyalinized pink/red material, about blood vessels and in general. B. The particularly glassy appearance of the material in areas is evident at high power. A. Pseudoepitheliomatous hyperplasia seemingly forms a dermal mass. B. Parakeratosis tops epidermis. C. Neutrophils lie in the center of the apparent mass. D. Diagnostic xanthoma cells lie in dermal papillae. A. The dermis resembles Swiss cheese. B. Macrophages, some with more than one nucleus, accompany empty ovoid spaces. C. Some macrophages resemble Teuton body giant cells. D. An admixture of lymphocytes is not at all unusual. A. Extending from papillary dermis into dermis is a chronic, blue inflammatory infiltrate. B. The infiltrate comprises lymphocytes, plasma cells, and macrophages. C. At the edge of the biopsy pink strews inflammatory cells; this pink invasion of inflammation, so to speak, is a good place to look for organisms. D. High power reveals sometimes budding yeast forms in clear spaces. Changes of herpes zoster in lower right abdominal skin of a 48 yo Hispanic man. A. Note the edema at the dermoepidermal junction along with a focal separation at the left as well as the inflamed superficial and deep blood vessels. B,C. Careful examination along the junction uncovers smudged chromatin diagnostic of viral infection. D. Vasculitis associated changes include extravasated neutrophils with nuclear dust, as well as pervascular macrophages, lymphocytes and occasional eosinophils. ↑ Elston, D. (Jul 2012). "Practical advice regarding problematic pigmented lesions.". J Am Acad Dermatol 67 (1): 148-55. doi:10.1016/j.jaad.2012.04.006. PMID 22703907. ↑ URL: http://www.nedermatology.com/skin-cancer-treatments.php. Accessed on: 26 February 2013. ↑ URL: http://histologyolm.stevegallik.org/node/119. Accessed on: 5 November 2013. ↑ Busam, Klaus J. (2009). Dermatopathology: A Volume in the Foundations in Diagnostic Pathology Series (1st ed.). Saunders. pp. 1. ISBN 978-0443066542. ↑ Trotter, MJ. (Jun 2011). "Melanoma margin assessment.". Clin Lab Med 31 (2): 289-300. doi:10.1016/j.cll.2011.03.006. PMID 21549242. ↑ URL: http://www.biology-online.org/articles/fibroblast_heterogeneity_skin_deep/figures.html. Accessed on: 29 March 2012. ↑ URL: http://melanoma.blogsome.com/category/skin-structure/. Accessed on: 29 March 2012. ↑ Busam, Klaus J. (2009). Dermatopathology: A Volume in the Foundations in Diagnostic Pathology Series (1st ed.). Saunders. pp. 4-8. ISBN 978-0443066542. ↑ HJ. 27 Feb 2009. ↑ URL: http://www.pediatrics.wisc.edu/education/derm/text.html. Accessed on: 18 September 2012. ↑ URL: http://dermnetnz.org/pathology/pathology-glossary.html. Accessed on: 8 August 2012. ↑ 14.0 14.1 Fung, MA. (May 2010). "'Epidermotropism' vs. 'exocytosis' of lymphocytes 101: definition of terms.". J Cutan Pathol 37 (5): 525-9. doi:10.1111/j.1600-0560.2010.01515.x. PMID 20132423. ↑ URL: http://www.medilexicon.com/medicaldictionary.php?t=63448. Accessed on: 13 March 2013. ↑ URL: http://dictionary.reference.com/browse/ortho-. Accessed on: 13 March 2013. ↑ Fung, MA. ; LeBoit, PE. (Apr 1998). "Light microscopic criteria for the diagnosis of early vulvar lichen sclerosus: a comparison with lichen planus.". Am J Surg Pathol 22 (4): 473-8. PMID 9537476. ↑ URL: http://www.eplasty.com/index.php?option=com_content&view=article&id=492&catid=171:volume-10-eplasty-2010&Itemid=121. Accessed on: 16 October 2012. ↑ Cotran, Ramzi S.; Kumar, Vinay; Fausto, Nelson; Nelso Fausto; Robbins, Stanley L.; Abbas, Abul K. (2005). Robbins and Cotran pathologic basis of disease (7th ed.). St. Louis, Mo: Elsevier Saunders. pp. 1065. ISBN 0-7216-0187-1. ↑ URL: http://ccr.cancer.gov/staff/gallery.asp?profileid=12822. Accessed on: 14 December 2011. ↑ URL: http://www.emedicine.com/derm/topic1.htm, URL: . ↑ 22.0 22.1 Mitchell, Richard; Kumar, Vinay; Fausto, Nelson; Abbas, Abul K.; Aster, Jon (2011). Pocket Companion to Robbins & Cotran Pathologic Basis of Disease (8th ed.). Elsevier Saunders. pp. 596. ISBN 978-1416054542. ↑ 23.0 23.1 Greenwald, J.; Heng, M. (2007). Toronto Notes for Medical Students 2007 (2007 ed.). The Toronto Notes Inc. for Medical Students Inc.. pp. D23. ISBN 978-0968592878.